It's a Doctor Who classic fan favorite, Tom Baker's complete final season on Doctor Who! BBC Studios and Fathom Events are giving audiences the chance to see Tom Baker's 100-minute final adventure, "Logopolis," featuring the first appearance of Janet Fielding as companion Teegan, Anthony Ainley as the Doctor's archenemy The Master, and the regeneration of Fourth Doctor Tom Baker into Fifth Doctor Peter Davison! This is a one-of-a-kind screening that fans won't want to miss featuring a brand-newinterview with Logopolis companions Janet Fielding and Sarah Sutton, filmed on location at Jodrell Bank, site of the Lovell Telescope and scene of the fateful final sceneof Logopolis, exclusive to cinemas. 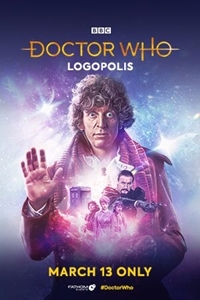 The interview will also include excerpts from Tom Baker's appearance in "The Making of Logopolis"